We experimentally created deltas in crater-shaped basins (in the Eurotank facility at Utrecht University) by feeding a range of constant flow discharges over a feeder channel of various sand textures. 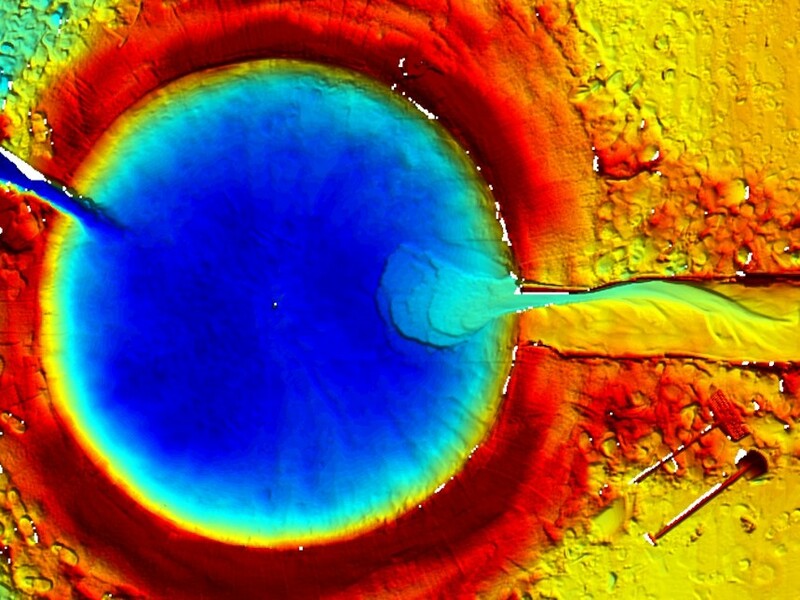 We constructed crater-shaped basins carved in sand, with diameters of 2 m and 4 m and shapes comparable to those of a complex impact crater of 40 km diameter without a central mound (Image. 2). Image 2: Example DEM of a retrograding, stepped, delta deposit in the large crater (4 m diameter). We reproduced three categorically different types of deltas including most of the types that have been identified on Mars (Image. 3). We found that water level behaviour, itself a unique function of flow discharge, basin size and hypsometry, and basin floor permeability, can explain most delta morphologies observed on Mars. Stepped, retrograding deltas formed during water level rise, prograding deltas formed in constant water level, and during water level fall deltas were partially destroyed by channel incision. 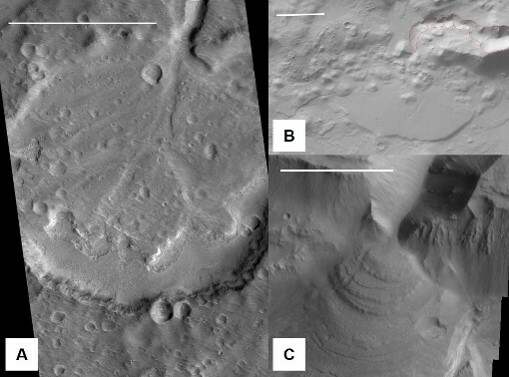 On Mars numerous retrograding and prograding deltas were preserved, most of them without indications of channel incisions or other fluvial modification. Furthermore the formative durations were modelled using flow reconstructions based on feeder channel dimensions and sediment transport predictors as performed earlier for full-scale martian deltas (Kleinhans et al. 2010). Image 3: Example photographs of delta deposits in the small crater (2 m diameter). A) Retrograding, stepped delta (run F) and B) Prograding delta (run G). White line is approximately 50 cm. Our observation that the main difference between a single-foreset prograding delta and a multiple-foreset retrograding delta is the behaviour of the water level in the basin. This leads us to conclude that these simple delta morphologies cannot be reconciled with long-duration hydrological activity, because that would imply complex morphologies due to inherent complex water level histories along with complex sediment delivery histories. Our experiments and numerical verifications demonstrate that such deltas preferentially form during one aqueous event, which parsimoniously argues for short-duration hydrological activity.